We who have spent a February or two in America’s public schools know intellectually that slavery is terrible. We look back with dewy young eyes on the Civil War era and nod along as our teachers describe what the lives of slaves were like. We know the words of the story by heart, an oft-repeated refrain that grows comfortable in its familiarity. We are so comfortable with slavery as America’s legacy that we can no longer see it for what it was. And what it was, was horror. Wench made me feel that horror. It scrubbed away the anesthesia of a childhood full of whitewashed history lessons and brought me face to face with the wrenching complexities that constituted slave life. Your child is not your own. Your child can be taken from you, at any moment, with no explanation and no recourse. Your husband is not your own. He is not even your husband; he is your owner, and can do with you whatever he chooses, indulge any whim at any time. Your body, your life, are not your own. During the time I was listening to this book, I had to sit with those thoughts. Afterwards, I felt my skin had been scrubbed raw. Perkins-Valdez takes us deep inside her characters. Lizzie, Reenie, Sweet, and Mawu are slave mistresses. They meet every summer at a resort in Ohio where their masters take them for some private time, away from judging eyes. Their position is an impossible one: they are in some ways favored—allowed to sleep in the house instead of the slave quarters, given better rations and clothing—but in others horribly exploited. The relationships share many dynamics of abusive marriages, with their constant ambivalence—the women never know whether they will be treated as human or chattel, and they can never trust their masters because the balance of power is always skewed. And still, these women have to get up every morning and live their lives as best they can, inside the web of a waking nightmare that has trapped them like flies. Are you feeling the tension yet? I love books that lift the veil from my eyes and allow me to see the world in a more honest way. Books that shock me awake like a bucket of cold water over my head. Books that tell me a story that in my jadedness I thought I’d already heard before. 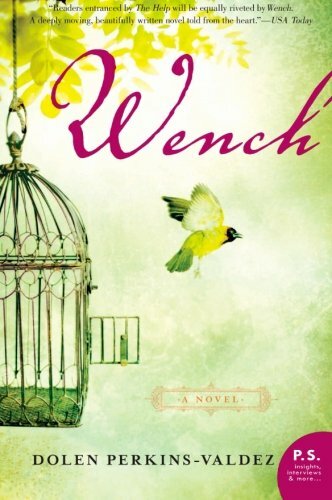 Wench does all of those things, and does it in lyrical, lovely prose, a stylistic choice which makes it all the more heartbreaking. An emotionally challenging but necessary read. Book clubs, order another round of drinks, because your discussion will run overtime.